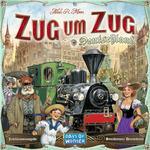 Zug um Zug: Deutschland is a stand-alone game in the Ticket to Ride series. Over the course of the game, players collect cards in order to then claim routes on the game board between two cities. Ideally the players create a network of routes that connect the cities showing on their secret ticket cards. Players score points both for claiming routes and for completing tickets, with incomplete tickets counting against a player\'s score. Whoever has the most points at the end of the game wins.